1050 aluminum coil belongs to commercially pure wrought family with a purity of 99.5% Aluminum. Except Al, 0.4% of Fe is added to 1050 aluminum coil, thus, it has high electrical conductivity. 1000 series aluminum group offers the best correction resistance compared to any alloy group, so does the 1050 aluminum coil. Haomei can manufacture and supply high quality aluminum coil 1050 with 20 years experience. Besides, different tempers are available, such as O (annealed), H12, H14, H18, etc. For its content above in the chart, 1050 aluminum scoil has high ductility and high reflective finish. Besides, 1050 aluminum coil is non-heat treatment series is produced in extruded sections. It has excellent cold workability, braze-ability and solder-ability, and it is strengthened by cold working. 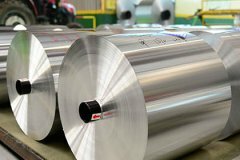 However, 1050 aluminium coil has low mechanical strength compared to more significantly alloyed metals. All of these characteristics make 1050 aluminum coil well suited to chemical and electrolytic brightening but not in casting. Last but not least, moderate strength and good anodizing quality enables our products has a vast application.